So you have the grill chosen, the refrigeration decision has been made, the ice machine has been selected with the special Nugget ice, now what are you going to put it all in? There are tons of options but really only one major mistake that you can make and that is all based on one word….fire. If you choose a material to make your kitchen from that could burn, you’ve made what could be a disastrous mistake. No matter what you’ve been told, what you saw on HGTV simply think about it this way; do you really want to have this as a concern? If you build the cabinets from metal or any masonry your concerns are gone. If you are consumed with it looking like wood that is not a problem just don’t use real wood in an outdoor kitchen, especially within 2 feet of any grill. Our opinion of the best way to do this is a system we have helped mature and that is one made of 1″ square tube aluminum. The design should be done with detail as seen below. The design should move forward to the construction of a “skeleton” of metal which defines where each product will go and exactly the dimensions of each cutout. It should be structurally sound enough to hold all of the weight of the construction. It should also be capable of being leveled precisely. Aluminum is the metal of choice as it will never rust, which will streak out from the corners of the kitchen years later staining the patio. The frame or skeleton can be made to accommodate any exterior facia but that decision must be made prior to the buildout so that the final dimension will be accurate. If the frame is made for a stucco exterior then it will be about 1″ smaller than the finished product but if you’re going to use real stone the frame will be about 9″ smaller than the finished product due to the size of the stone that will go around it. 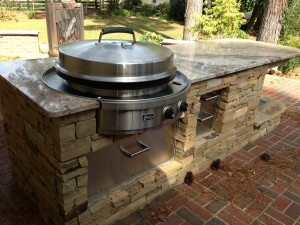 Finished product is what you designed and incredibly strong with virtually no fire risk. If you choose this path you can use any, non-combustible, exterior you like. We have worked with jobs on stucco, brick, river rock, stack stone faux and real, tile, cement, literally everything. What about those that don’t want the look of stone, stucco or brick? Stainless Steel cabinets can be an incredible outcome and are built offsite so the mess and construction at your home are limited. Danver Cabinets makes beautiful product that can also be made to look exactly like wood. 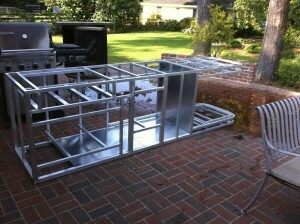 The design and layout are defined, the product is ordered and assembled when delivered to your home. 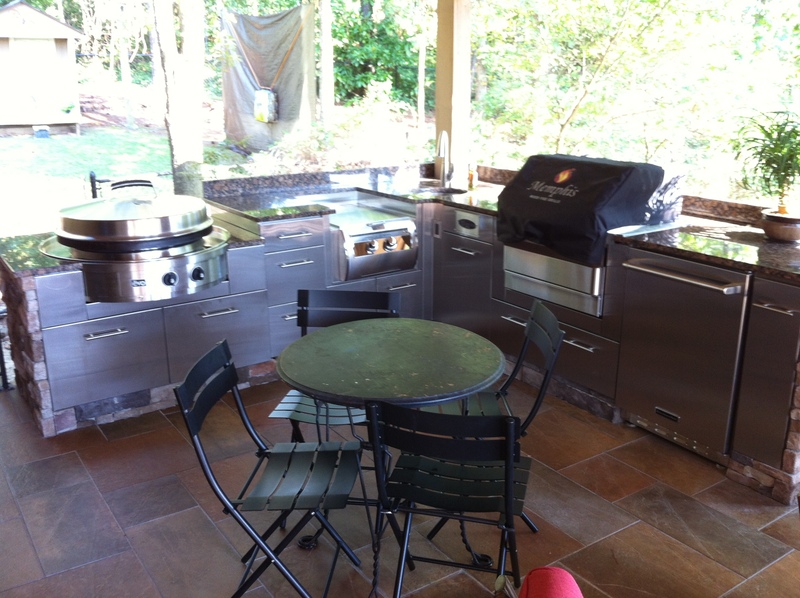 Below you can see a Danver kitchen that Fireside Outdoor Kitchens sold in the Aiken, SC area. Recently Brown Jordan has jumped in working with Danver and offers colors and door styles exclusive to the Brown Jordan line, www.brownjordanoutdoorkitchens.com. Stainless custom built cabinets with stone toe kick and end caps. 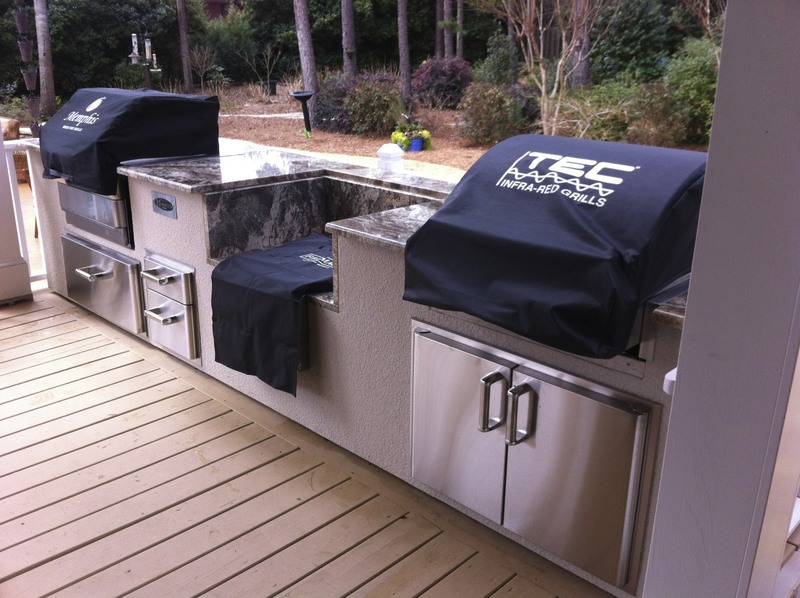 Among our favorite materials to use for outdoor kitchens is High Density Poly Ethaline (HDPE) better known as Marine Grade Plastic. The material is FDA approved for food service, commonly used in commercial kitchens, has been used for years in the construction of boat consoles and is very attractive. It can be built into virtually any configuration and is sold finished so the only thing to do when it arrives is assemble it and put the the counter on and the appliances in. Additionally you may want the look of wood but not the headache of maintaining it along with the concerns mentioned earlier regarding fire risk. For this you can choose from a beautiful system of using PVC for the cabinet body with an epoxy resin mold of wood which is then painted to match a variety of wood tones. These are extremely strong and low maintenance solutions. Another good option for the outdoor cabinet is aluminum cabinets, the leader in this area is Challenger Cabinets. 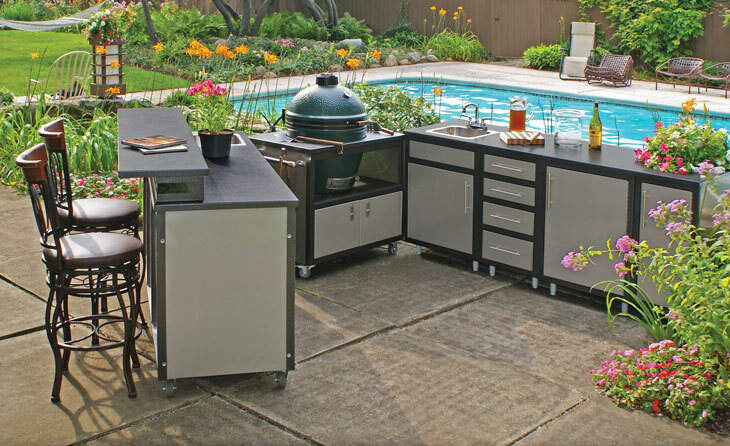 It is available in 3 product types, stand alone carts which are already made and you choose from sizes, Pre Configured Outdoor Kitchens and Custom Outdoor Kitchens. 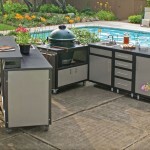 The Custom Outdoor Kitchen line is a polished durable and really beautiful outdoor solution made entirely from aluminum. Please consider that while we love the outcome of the products from Challenger it has been our experience that the lead time is extraordinarily long and the delivery of customer projects completed accurately is poor. We have experienced this with multiple projects over the last 2 years and will post if we see an improvement. Werever Marine Grade Plastic cabinet recently installed in the Augusta, GA area. Beyond the convenience of having it built elsewhere the Stainless cabinets, Aluminum cabinets, PVC and the HDPE cabinets all offer the user tons of functional storage within the cabinet. If you go with a more traditional approach of stack stone, brick or stucco you will spend less on the “cabinet” in many cases much less. Once you build the cabinet however you won’t have storage so you’ll have to choose doors, drawers, trash cabinets and other pieces that will be inserted into the cabinet. (For more on this topic see Outdoor Storage Solutions) If you are looking for a finished product without alot of storage options you will spend alot less with the traditional approach, if your design includes storage similar to that of an indoor kitchen you could actually save money using the SS, PVC or HDPE cabinetry because it is completely built with storage space included. The kitchen above for instance has 2 trash cabinets, 2 open storage areas under the grills, 5 drawers and a charcoal storage area. These storage options if inserted into a traditional kitchen would be from $250.00 to $1,400 each so quickly that can make the cost of traditional construction change drastically. What is it going to cost to build my kitchen cabinet? This is totally based upon your decisions for the exterior. the least expensive is going to be stucco on a metal frame. We sell finished cabinets with stucco already applied for $275.00 per linear foot for example. 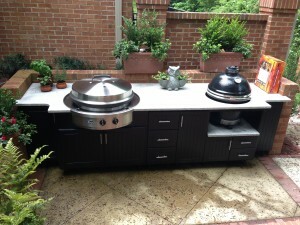 The answer to this question is that you can build a finished outdoor kitchen including appliances for a range from $440.00 per linear foot to $2,500 per linear foot depending upon the cabinet, the appliances and the granite. This kitchen was delivered with the stucco already applied and was cooking as soon as the granite was installed. If you choose SS cabinets you could be looking at between $950 and $1600 per linear foot depending upon the design, size of the project and what is going in the project. HDPE can run as low as $650.00 per linear foot and is among our customers’ most popular selection. PVC is the top choice of our customer and is generally about $950.00 per linear foot but can be considerably more depending upon color and door style selection. 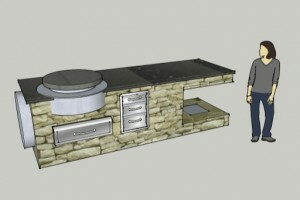 Once you have the cabinet defined you need to choose the exterior and the granite. If you chose SS,PVC, HDPE, aluminum you already made your exterior decisions, otherwise your finish or stone selection will have a big influence on the overall finished cost of the project so make all your decisions before you place any orders. Granite can range as low as about $35.00 per square foot installed to at least 6 times that. Make this decision in advance and if you have a budget stick to it and don’t just fall in love with a stone and blow the budget, as many do. Why aren’t we talking more about cement block for the cabinet construction? We don’t love it, and it isn’t because we don’t sell it. If you build with cement block it is non combustible and it is a perfectly reasonable way to build a BBQ Island but it limits what you can do considerably. In addition it is very heavy and cannot be used on a deck. The square tube aluminum is such a weight savings for the foundation of the kitchen that it can easily be used on wood or cement that doesn’t have the foundation to support a cement structure. Many of our customers want alot of detail in the finished project and in some cases that means that appliances, doors, controllers, etc end up very close to one another and that is simply not possible with block construction because the block is usually 6″ thick. This means that you have to build a 4″ or 6″ column between each item in the kitchen which also means that the inside of the cabinet ends up being this series of small areas with rough mortar protruding out from all the blocks. We have found that the frame system allows our customers to use the entire inside of the cabinet for functional storage or simply access to electrical, plumbing and gas lines. Additionally the inside is smooth so you don’t cut your hands on it and we include a metal floor pan so your “stuff” isn’t sitting on the cement pad which can become wet with high humidity. So does block style construction cut it, yes, do we love it… no. We would only recommend it when the budget demands it (that is actually quite often), or you don’t want much storage.